Iptables is basically the main firewall used for Linux systems, there are alternatives like nftables but Iptables remains the main one, it is very flexible by accepting direct commands from the user, you can load and unload rules upon need in order to increase your firewall’s policies accuracy. Actually you don’t even need to know the Iptable’s syntax to use it, you have graphical tools like Firewall Builder which can make the learning process unnecessary but if the desire is to increase Linux administration knowledge Iptables is the first step to learn how to practically administrate security under Linux and even ease managing CISCO or Fortigate security devices and similar. Iptables basically allows you to instruct your system to accept, refuse or forward a connection depending on chosen parameters, for example to redirect all connections to X port to a different IP address, to block all connections coming from a specific IP, IP range or to accept all connections coming from whitelisted IP addresses among many other functions. In this tutorial we’ll learn how to protect a Web Server, how to forward connections to internal IP addresses from our LAN and how to offer specific services to whitelisted IP addresses only. 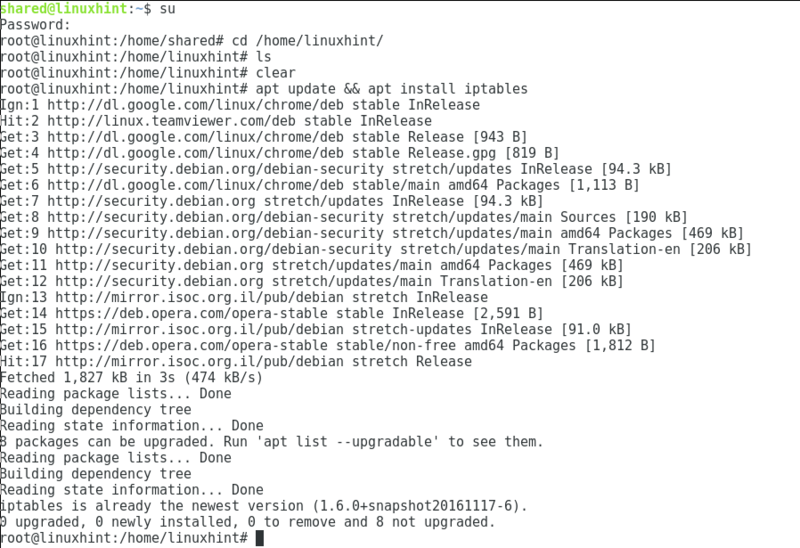 To install iptables on Debian/Ubuntu systems just run “ apt update && apt install iptables” as root or with “sudo” as prefix as in the following image. First of all lets add all ACCEPT policies starting by the web server. -j = specify the “target”, the target is the kind of policy: ACCEPT, DROP, QUEUE or RETURN. Then on the sample of the image above we are telling Iptables to add a rule for incoming traffic through TCP protocol and ports 80 and 443 to be accepted. Iptables -L -v = the same with verbosity. As we can see the port 80 is open both according to “iptables -L” and Nmap. #Open HTTP and HTTPS services. -m = means “match” and is used to call Iptable’s extensions like conntrack which is not part of iptable’s core functions. conntrack = Allows to track information on connections like specific addresses or in this case the state of the connection. This must be used carefully, since many rules to defend servers from some attacks use conntrack while it’s use is limited by the hardware and such limitation can be used to overload the server’s resources. -ctstate = determines the state of the rule to match, the possible states are: NEW, ESTABLISHED, RELATED and INVALID. In the first liNe our rule says “-m conntrack –ctstate NEW” which means if the connection is new then pass to the rule “22-test”. The second line says packets netmask 255.255.255.255 are named as CONNECTIONS . The third line says if a CONNECTIONS is seems over 3 times within 30 seconds the firewall continues applying the chain 22-protection. The fourth line says if the CONNECTIONS wasn’t seem over 3 times within 30 seconds it can be accepted. Fifth line, which belongs to the 22-protection chain says to drop CONNECTIONS if seem over 3 times within 30 seconds. Where -P means the target’s chain, remember the target is the policy, ACCEPT, DROP, QUEUE or RETURN. In this case we are saying the default policy for outgoing traffic is to accept and the default policy for incoming traffic is to refuse, unless we specified something different in previous rules. This is a very basic firewall which does not includes rules for many attacks, for learning purposes and not for production, at the end of the article I attach a firewall I used for production on a server, it has comments explaining each rule. This is very useful also for desktop users who want to enroute a connection through a specific device, it can be useful even for gamers, usually we do it from the router’s settings but let’s assume the routing device is running Iptables. The rules above invoke to NAT (Network Address Translation) to specify connections through protocol TCP, to the address X.X.X.X and port 8080 will be redirected to address Y.Y.Y.Y, port 80. The second rule specifies replies must be sent to the source address (X.X.X.X). We can use these rules to allow access to an IP camera, to enable online gaming with external networks, etc. This tutorial was meant to introduce beginners to Iptables and only explains a limited number of basic functions. Below you can see a sample of a well planned firewall which was used for a production server, it includes from some of the rules we already saw to more complex rules to prevent DDoS attacks among others. The next tutorial will be on sniffing within local networks, but on a next tutorial i’ll explain some of the rules applied to the firewall below. Thank you for following LinuxHint.com, keep following us for future updates on Iptables and Linux in general. #We told the firewall to take all incoming packets with tcp flags NONE and just DROP them. --rttl --name SSH -j LOG --log-prefix "SSH_brute_force "
#Now I allow imap,and smtp.